This house was built in the late 16th or early 17th century. A brick wing added at the back in the late 17th century, of two storeys with lime-ash floored attics, was formerly a separate tenement. 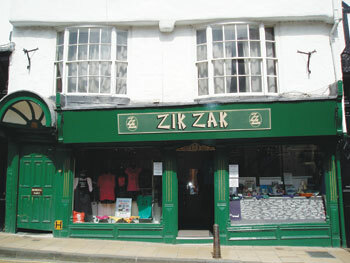 In the late 19th century a shop front was created which is still in existence . The property was purchased by the Trust in 1998. The original building is a timber framed three storey bay front with the upper floors jettied. The whitewashed plaster front has a timber door and hood leading to a side passage. The shop front is of grooved pilasters with moulded imposts on tall and gableted consoles. There is a glazed and panelled door with a shaped lintel carved with the initials MD flanked by plate glass windows between colonnette jambs with moulded capitals and carved spandrels over raised panel risers. The first floor windows are tripartite bows with 16 pane centre sashes and three light casement windows on the second floor. The panelled door passage entrance is protected by a ribbed shell hood with a lion mask boss on shaped brackets. Internally the majority of the timber beams and joists are exposed and the property is converted into two flats.